If I ask you to name the organization which you think could be synonymous with innovation then probably you can name many. But which are the top of the mind innovative companies in the field of healthcare that comes across to your mind. Not many perhaps. One such company is Philips, which is not only launching innovative healthcare and consume lifestyle products into the market but are really adamant to change the lives of people around the globe. According to Jim Andrew (Chief Strategy and Innovation Officer, Royal Philips), Philips aim to improve lives of 3.3 billion people by 2025 through their innovative and upto date products. This can be reflected from the fact that in 2013 Philips invested 7.4% of sales and EUR 1.7 billion in R&D. Philips has 59 innovation centers around the globe thriving on the belief of ‘Global Presence, Local Relevance’. On 3rd April, 2014 I had the privilege to attend Philips 2014 Global Media Onsite Event at Philips Innovation Campus in Bangalore, India. At this event, Philips kept its promise of introducing innovative and revolutionary products and launches some of the path-breaking products into their healthcare and consumer lifestyle portfolio. These products are aimed to solve three major hurdles being faced by healthcare industry, popularly known as AAA challenges: ‘Affordability, Accessibly and Awareness’. VISIQ-Ultrasound: It is the first portable touch-based ultrasound machine into the market by Philips. Over 40% of maternal deaths occur simply because we lack access to basic equipment, particularly ultrasound. With the launch of this portable machine (around size electric razor), Philips aims to enhance healthcare accessibility and to reduce procedural complexities with immediate results. VISIQ runs on battery, so no electricity is required, and can easily be connected to tablets or TV for viewing immediate results. It wakes from sleep mode to scan-ready in seconds, and can scan continuously for 2.5 hours on a single battery charge. It delivers enhances image quality and allows clinicians to increase access to quality diagnostic scans. This device can have a huge impact in providing quality diagnostic healthcare in developing countries like India where more than half of the population lives in remote areas lacking access to quality healthcare. Imagine the joy on the face expectant parents when they can clearly see their unborn child’s fingers and toes on the tablet’s screen. Sujit Kumar, General Manager, Ultrasound Business, Philips Healthcare says that “Its utility is not restricted to labor and delivery room. This has huge application in areas such as point-of-care and critical situations like calamities and accidents”. Surely, VISIQ has been formed to cater to the evolving needs of patients and physicians and with such digital innovation Philips is set to change the healthcare paradigm. ECG Portable: Try and digest the following facts: In world, number one killer is cardio-vascular disease (CVD) followed by cancer. In India, 62 million people suffer from CVDs and 50 million people suffer from cardiac arrest. 5 million people die per year because of some form of CVD. This is reflective of the high prevalence of CVD in India. 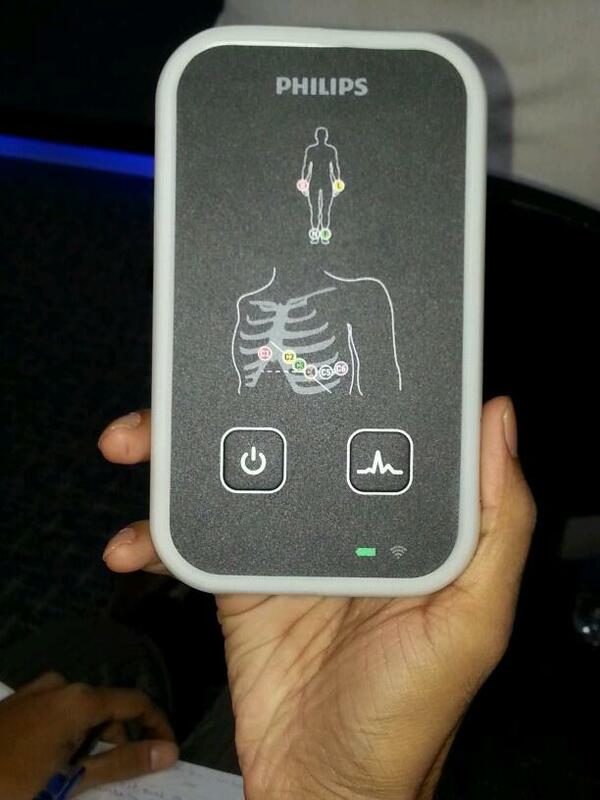 The healthcare world is already working on the curative end for CVDs but Philips is planning to move one step ahead and want to touch the preventive end by introducing an ultraportable (size of a 5 inch phone) 12 channel ECG machine. This device can be connected to mobile, tablet, laptop, TV etc. and enable the clinicians to take an ECG with ease and share it with another clinician sitting in some other part of globe within minutes. And yes, you can ‘Whats App’ or ‘Gtalk’ the ECG as well. Such breakthrough products are a major requirement by the healthcare industry which is currently suffering from high cost, inferior quality and poor accessibility. Philips, with its business and innovation leadership in healthcare, is leveraging competencies across healthcare ecosystem and is developing solutions and products for global markets. What do you think of these innovative products? Do you think these devices can make healthcare more accessible and affordable? What can companies like Philips do to achieve better healthcare outcomes? Do share your views and watch this space for more on the innovative products launched recently by Philips. Previous: Previous post: How innovative technology is helping early diagnosis of cancer? Next: Next post: Honey! Let me sleep..
Great post. Philips is really an innovative company, VISIQ is my dream product, my wife just got pregnant and knowing how is the baby in the tummy would be the most transparent process ever. I hope more companies will follow this trend of helping people on real problems. Fantastic to know your experience. I can imagine your happiness. Indeed other organizations should take a leaf out of Philips book and design more innovative products.